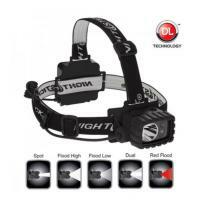 This Dual-Light Multi-Function Headlamp is the ideal hands-free lighting tool when working in a location where maximum lighting options and maximum run-times are a requirement. The top mounted dual switches provide white spotlight, high & low-brightness white floodlight, red floodlight and dual-light control. With the battery compartment located in the back, optimal balance is achieved whether the light is worn directly on the head or on a hard hat. The light includes two straps¦the heavy-duty rubber head strap for use on a hard hat and the non-slip elastic head strap for use on a ball cap or directly on the user's head. Power is supplied from 3 included AA batteries.